My very first trip abroad...September 2005. It's a wonder I ever traveled again after that adventure. Marie and I planned to meet at JFK. She was the keeper of all the details of our trip...train reservations, hotels, rental car. All I knew was we were on the same flight from NY to Paris. As I waited to board, it suddenly dawned on me that we had no Plan B...no cell phones, no alternate meeting place. What if her flight from Los Angeles was late, cancelled? I looked and looked; I never saw her until I was in line to board. There she was two people in front of me...whew! Lesson learned: always have a Plan B! Next snag...we sat for 6 hours!! on the plane at the gate. You don't even want to know the story behind that! Luckily, Marie had upgraded my ticket with her miles to business class, so we had all the wine we wanted to drink while we waited. Of course, with a 6 hour delay, we missed our TGV to Avignon and had to re-book our first class tickets. It was pitch dark and pouring rain when we finally picked up our rental car at the train station in Avignon. I was driving, a complete novice to French roads, signage, and this funny car that was both a manual and an automatic. Marie kept saying 'I think we're on the right road.' You think..OMG...I want to know I'm going the right direction. It wasn't long, however, before we saw the sign for Goult and knew we had made it. We arrived at Patrick's restaurant after 10 pm. exhausted, wet and starving. While there were still people eating, he had stopped cooking, but he put together a simple dinner of soup, salad, bread and most importantly, wine. It was the perfect weary traveler's meal. Revived, I walked down to my chambre d'hotes where I fell into bed and slept like a dead person. 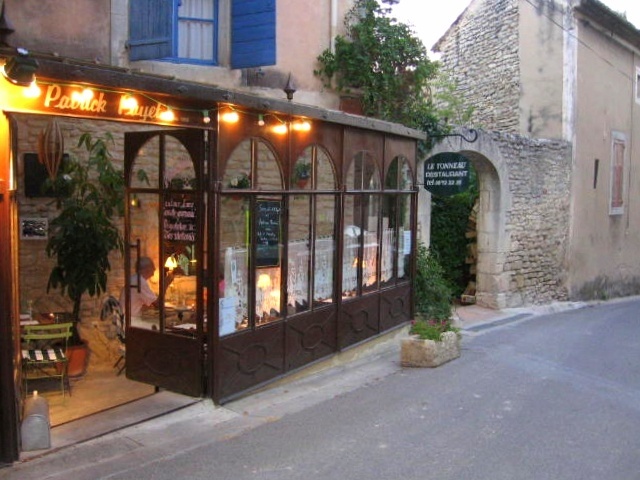 All the worry, frustration and fatigue evaporated the next morning, though, when I threw open my shutters and looked out over the Provencal countryside. 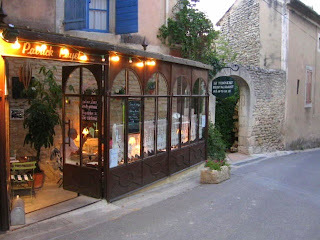 Ah, Provence...it captured my heart in an instant! 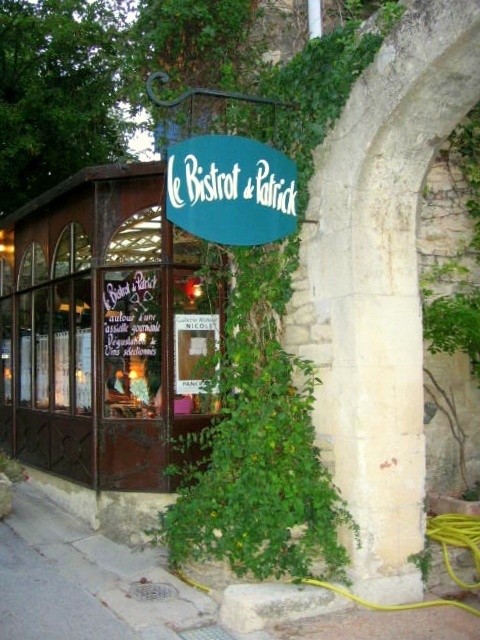 Patrick has since closed his restaurant and moved his cooking school to Cavaillon. If you've ever wanted to take a fun French cooking class, click here to read about Patrick's school, Famous Provence.